The only road linking Lafia, the Nasarawa State capital, to the Federal Capital Territory, Abuja, is about splitting into two at the Yelwa settlement, on the outskirts of Makurdi, Benue State. The situation was of serious concern to motorists and commuters plying the road on Tuesday as many of them were seen by our correspondent lamenting long hours spent on the road. 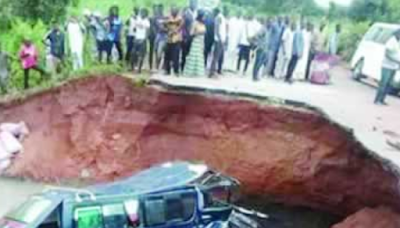 A bus passenger, who identified himself simply as Chukwu, told Punch correspondent that he and his co-travellers had spent several hours on the same spot with no relief in sight. Punch Metro learnt that the Benue State Governor, Samuel Ortom, had ordered a repair of the bad portion of the road. Ortom reportedly asked the CGGC Construction Company to immediately carry out rehabilitation of the failed portion to make the road motorable again. A state official said work on the road would commence on Wednesday (today) and would be supervised by the Commissioner for Works, Transport and Energy, Emmanuel Manger. The governor was said to have expressed concern about the hardship faced by motorists on the road. He restated the commitment of his administration to making life more meaningful for the people in various sectors of the economy.